In our search for innovations in Sewage, Water and Effluent Management, we have developed a new technology Decantech Decanter. Our Decantech Decanters are specially designed to provide Efficient Decanting Solutions for Sewage Treatment Plants, Water Treatment Plant, Jackwells, and Effluent Treatment Plants. Our Decantech Decanters are completely automated, and use variable frequency drives to control precisely the movement of the decanting trough, so that the operators derive uniform, precise and durable decanting tasks. Equipped with PLC programmable panels, these Decantech Decanters are completely automated. The panels take reference from increasing or decreasing water levels in the tank and decide the rate at which decanter trough lowers or rises. Our Decantech Decanters are best suitable for Small Sewage Treatment plants since they are extremely cost-effective, have a smaller foot print in the process tank and reduce RCC construction and maintenance costs. Our Decantech Decanters reduce the loads on the construction structures. 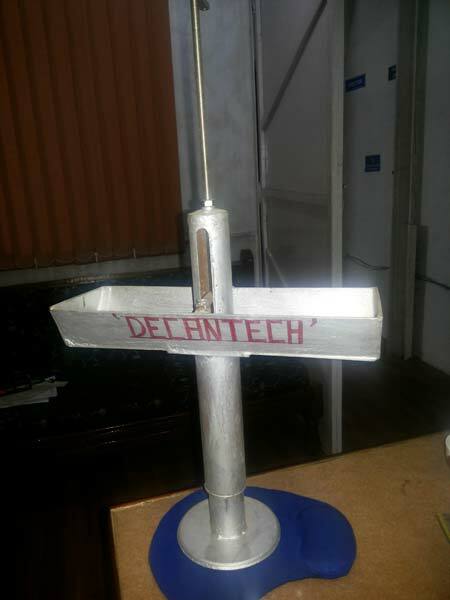 These Decantech Decanters are completely made in AISI 316 and AISI 304 and with our special ‘DECANTECH’ seals. These Decantech Decanters offer no chances of leakage. We provide Decantech Decanters for 25 – 1000 KLD and above capacity plants.